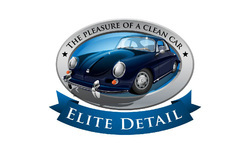 Providing top level service to discriminating clients, Elite Detail is setting the standard for exceptional auto detailing in the Walla Walla Valley. Owner, Bill Winkle takes pride in the artistic work of transforming your daily driver into show room condition, or maintaining the pristine condition of your exotic, new, or collector car. Only the best proven techniques and top-tier products are used to make your vehicle look amazing. As a mobile business, Elite Detail also offers convenience; Bill works at your location, on your schedule.